Thank you Celia once again! 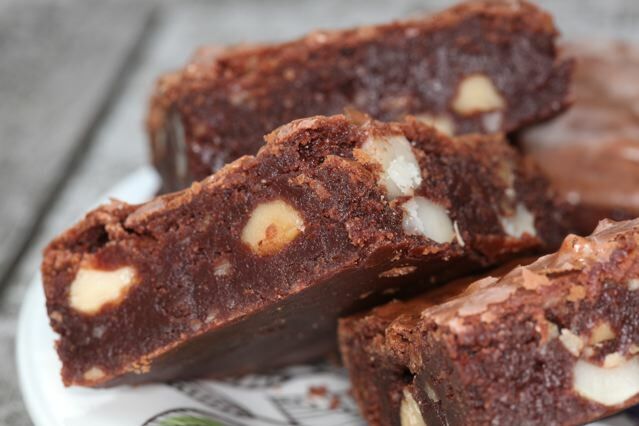 Celia, the chocolate expert at Fig Jam and Lime Cordial has written a perfect post on the perfect brownie here. This is a fantastic and simple recipe from David Liebovitz’s Room for Dessert, beautifully explained by Celia with how to do it photos, so get over there and say hi and download her pdf on how to do it. I used Co-op Fair Trade dark chocolate which has less cacao in it than my regular dark chocolate, 48 % as opposed to my usual 70-80 % and it worked brilliantly. Tips like that make all the difference sometimes. It’s worth buying chocolate as close as you can get to that specified if you want a similar result. I used a mixture of nuts, brazils, walnuts and almonds as I had run out of hazelnuts which are to my mind the best nuts for this. I might make the all chocolate version next time! And there will definitely be a next time. 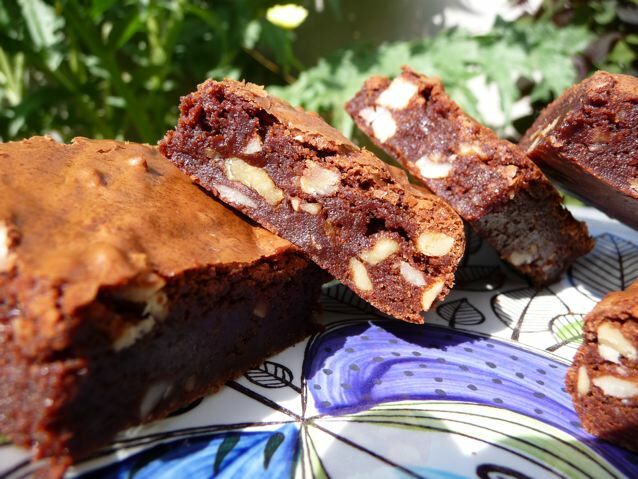 This entry was posted in Cakes and tagged cake in a saucepan, chocolate fudge brownie, Co op, David Liebovitz, Fair Trade chocolate, fig jam and lime cordial on 06/07/2010 by Joanna. I almost melted here, my day just starting, some green tea and a dream of chocolate brownies…. I only have higher cocoa chocolate in the house, you are absolutely right – the cocoa level will change everything in a recipe such as this. Wow, these look amazing! Heading over to Celia’s blog right now . . . . . .
Hope they work for you Abby! You were quick off the mark with these brownies, Joanna. I’ve been eyeing them up myself. Did you find it easy to identify the ‘snap’ that Celia mentions, which is so important for the correct texture? Like a poodle who has spotted a squirrel, Suelle :) It was the saucepan that appealed most to me, I have a definite weakness for sweet things made in a saucepan, lets me off the hook of creaming and whipping and those other state change activities that making cakes seems to involve… the snap was a cinch compared to those…. Joanna – thank you for the chocolate tip. As I only buy 70% plus, I was rather floundering at Celia’s tip to use a lower cocoa content chocolate. It is a good tip though and now I understand why my chocolate ganache so often splits. Yours look most delicious. There’s only one answer to that – you might have to try both… anyone around to help you test them? Oh and I had another look at my Twitter account, still makes no sense to me, what does RT mean? How do they all know what everyone else is on about? How do you keep up with it all and stay sane? I think I had better go and do some deadheading tomorrow, and I meant to tell you the ladybird larvae have started to pupate, they are hanging on a garden wall, at least that’s what I think they’re doing…..
Hmm, it seems I really do need to stop making other stuff and start getting cracking with some brownies. I still haven’t made one before and with all these brownies popping up… There certainly won’t be any complaints from the boys.